Since our beginnings in 1987, HoMedics has created, innovated and refined a remarkable line of personal wellness products to become the recognized #1 Brand in Massage. But massage is not all we do! HoMedics has a full line of in-home wellness products that are uniquely designed to promote your well-being; including: Air Filters, humidifiers, sleep aids, fitness monitors, and more. The HoMedics White Noise Sound Machine offers 6 different nature sounds including: White Noise, Thunder, Ocean, Rain, Summer Night, and Brook. The white noise machine features an adjustable volume setting allowing you to easily relax or fall asleep, even with undesirable background noise. The SoundSpa supports multiple power settings. It can be plugged into a wall outlet with its adapter (included) or powered by 4 ‘AA’ batteries (not included). 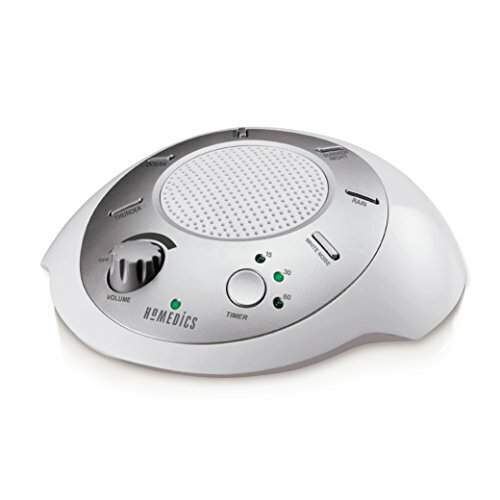 The HoMedics SS-2000 white noise machine is designed with an auto-off feature. Set the timer to 15, 30, or 60 minutes. Or, if you choose, leave your noise machine on all night! Our Sleep Sound Machine is small enough to fit into any purse or travel bag. Bring your relaxation sounds with you when you travel to create a peaceful “At Home” ambiance. This works for adults, kids, and babies! HoMedics SoundSpa sounds are created to mimic the natural environment and provide the most relaxing experience for you. Enjoy these sounds whether you are trying to sleep, relax or study. Our natural sounds work great for calming down your baby as well. It makes the perfect addition to any nursery. The rhythmic sounds instill a feeling of comfort that lulls people of all ages to sleep, with a built-in auto-off timer.